Connect your Autoquad contoller to QGC via Serial or USB – Forgot how? Go to ‘all parameters’ window. 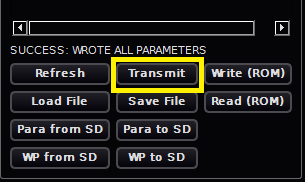 Once loaded, click on ‘Transmit.’ A successful transmission status message will be displayed beneath the parameters list. 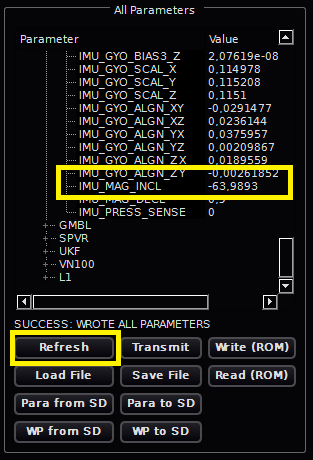 Finally, if you have a DIMU V6 board or an M4, you can now save the IMU parameter section into EEprom memory. Restart (powercycle or reset) the autoquad controller. Open the “all parameters” tree and hit “refresh”..
Now that you are done with all that, you may want to read Calibration FAQ & Additional Documentation and especially How To Determine A Good Calibration Result. Change your CONFIG_VERSION to 0 in the parameterst of QGC, transmit, and write the changes to ROM. After a reboot your values are reset to default. Insert the card into your AQ board and reboot. This page was created on 18-Jun-12 by menno. Last modified on 18-Oct-14 by jussi.